Caryn won the prize from Columbus Pedal Wagon, a two hour outing with 14 of her friends. If you know Caryn be real nice to her now. It looks like Caryn posted 3 comments in the 7 to 8 days of the raffle / drawing. I mistakenly locked comments on the post for about 12 hours on the second or third day of the ColumbusBestBlog.com / 365 Things to do in Columbus Ohio drawing. Duh! As I closed commments on Win a Columbus Pedal Wagon Party for your Pals I mistakenly closed comments on the original post where the comments for the drawing belonged. Like the Pedal Wagon Page on Facebook. It is easy to get to the Cbus Pedal Wagon Facebook page from the Pedal Wagon website (first link at the top here.) Follow the Pedal Wagon on Twitter too. I do. The Twitter link is on the Columbus Pedal Wagon website too. The Pedal Wagon website serves Cinci and Columbus. It looks like team work in the comments. It looks as if Leanna, Frank and Caryn are friends. Then again perhaps not. It is definitely okay for Caryn and her friends to go “woo hoo” and jump up and down. They are ready to party on the Columbus Pedal Wagon! Caryn is in touch with Stuart Naeny the manager of the Columbus Pedal Wagon. 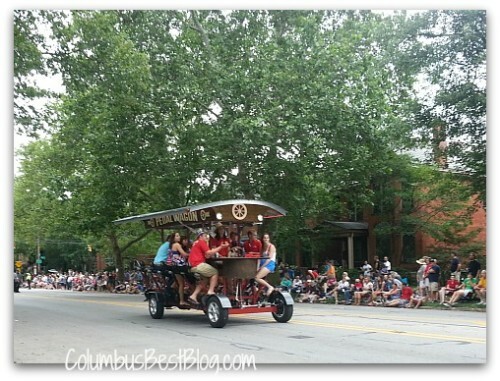 A traditional Pub Crawl on the Columbus Pedal Wagon gets pedalers (meaning those that pedal not peddlers) into some of the best places in town. Congrats to Caryn, the Columbus Pedal Wagon Party Winner! Thanks Leanna! You, Frank, and I will have a great time! Teamwork!!! Woo hoo!!! Columbus home prices rise to 2007 price!